The name can be traced back to North American aboriginal peoples, who referred to the full moon in April as a pink moon after a type of wildflower that blooms early in the year, helping to signify that spring has arrived. April’s full moon goes by a number of other names in different cultures. Some coastal tribes refer to it as the fish moon because it coincided with the shad swimming upstream, according to the Farmer’s Almanac. 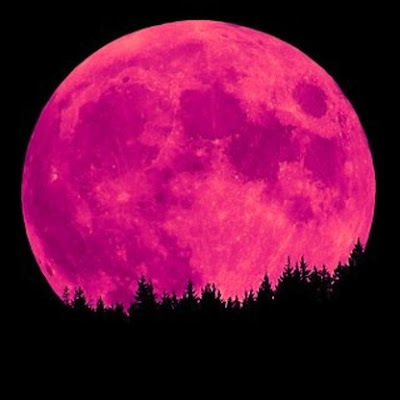 The moon doesn't actually appear pink in color..
What’s different about this pink moon? It coincides with the first lunar eclipse of the year, which will be visible for those living in Eastern Europe, Africa, central Asia and western Australia, NASA says. It’s a partial eclipse that will last about 27 minutes and will be at its fullest at 4:07 p.m. ET. It won’t be visible from North America, the space agency says. What’s the best way to view it? For those who want to see the eclipse but aren't located in the right place, the Slooh telescope will be streaming a live video of the event online. For Canadians who want to take a look after sunset, Environment Canada is forecasting a clear night sky for those living across much southern Quebec, New Brunswick, parts of northern Ontario and the southern Prairies. Another partial lunar eclipse will take place on May 25, and NASA says it should be visible from most of North America, provided the night sky is clear.